The invention relates to a ventilation assembly comprising PCM, a method for ventilating a building or a room in a building, a heat exchanger for a ventilation assembly, and a control device for a ventilation assembly. A ventilation assembly may have been installed in a building or a part thereof, for the supply and/or discharge of air. Such a ventilation assembly may be part of a climate system for controlling an indoor climate in a building, but in some cases also form the climate system. WO2003/102484 relates to conditioning air in the room of a building in terms of heat and/or cold and optionally humidity. According to the abstract supplied air flows into the room of the building and the extracted air is conducted out of said room, whereby a sensitive recuperative heat exchange is carried out between the supplied air and the extracted air, preferably prior to the influx of supplied air and after the discharge of extracted air from the room of the building. According to the abstract it is furthermore advantageous if a separate supplied-air conduction device, which forms a supplied air flow, is provided and the temperature of the ambient air is modified by latent heat accumulator bodies that have been arranged in the room of the building. Said latent heat accumulator bodies can be located in particular in the vicinity of the ceiling. Thermal buffer elements that operate by means of latent heat can furthermore be provided. 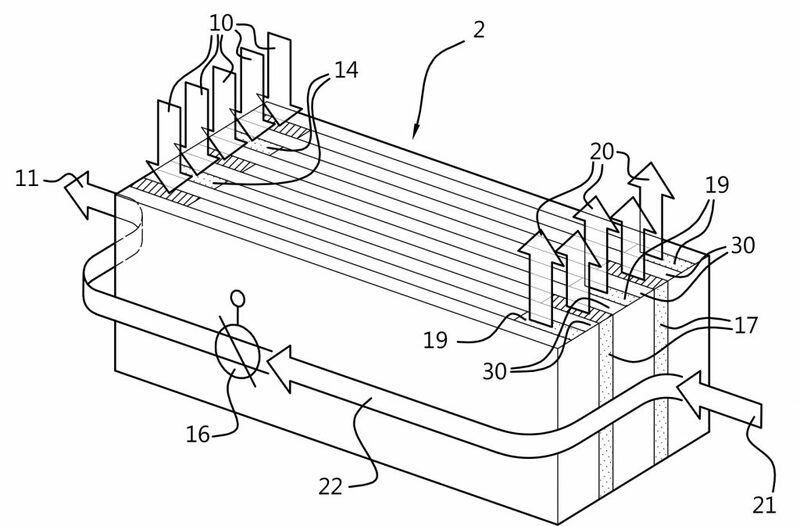 According to the abstract, WO2009/101398 describes a transportable PCM (phase change material) module comprising a number of PCM packs; a housing for thermally insulting [ … insulating] said number of PCM packs from a module’s surrounding medium; spaces separating said packs and forming one or more channels for the flow of a fluid; said housing incorporating a fluid inlet and a fluid outlet; whereby, in use, fluid flows through said channels from said inlet to said outlet. A PCM (phase change material) pack comprises a laminate of a first conducting panel and a second conducting panel enclosing a portion consisting primarily of PCM; wherein said portion of PCM incorporates thermal conductors. It is an object of the invention to provide a ventilation assembly with which optimal use can be made of conditions outside of a building and of so-called phase change material, also called PCM, for ventilation of a building or a room in a building. – a second setting in which inbound ventilating air has a second air supply flow rate and in the heat exchanger is substantially in heat exchanging contact with the PCM material, wherein inbound and outbound ventilating air are not in heat exchanging contact in the heat exchanger, and wherein the second air supply flow rate exceeds the minimum requirement of ventilation flow rate for creating extra cooling. By using such an assembly or method it is possible to ventilate, cool, and heat and realise heat recovery. In one embodiment the second air supply flow rate is at least twice as large as the first air supply flow rate. It has turned out that at such a difference a good heat recovery effect can be achieved in combination with a setting for heating or cooling by means of energy storage in the PCM material. In one embodiment, in the first setting, the air displacement device has been set for a balanced ventilation. In one embodiment, in the second setting, the air displacement device has been set for a balanced ventilation. In combination with balanced or substantially balanced ventilation, optimisation between heat recovery and use of PCM material is possible. In one embodiment, the air displacement device comprises an inbound air displacement device for displacing inbound ventilating air and an outbound air displacement device for displacing outbound ventilating air. In that way the operation between various settings can be set and optimal use can be made of the PCM material at a reduced use of energy. In one embodiment the control device is functionally coupled to the air displacement device for influencing the air flow rates. In one embodiment the ventilation assembly has furthermore been provided with flow limitation devices, in particular valves, functionally coupled to the control device, for influencing the air flow rates. By means of said means switching between settings can be realised and flow rates can be further set. In one embodiment the ventilation assembly has furthermore been provided with flow limitation devices, in particular valves, functionally coupled to a control device, and wherein the control device has been functionally coupled to the air displacement device, for influencing the air flow rates by setting the flow limitation devices, the air displacement device, or a combination thereof. The control device is able to control the flow rates by means of the valves and air displacement devices, for instance to be coupled to temperatures to be measured, and for instance the capacity and status of the PCM material. In one embodiment the inbound and outbound ventilating air are separated in the heat exchanger by means of PCM material, in particular PCM elements, wherein in particular the PCM elements comprise a container of synthetic material, which container is provided with PCM material. In that way it is possible to build a compact heat exchanger. Surprisingly it turned out that the use of PCM in a heat exchanger, which at first sight seems undesirable because of possible losses and slowness of the resulting system, is not disadvantageous, on the contrary, it results in a wider applicability and energy reduction. In heat recovery applications the yield, seemingly reduced by the PCM, turns out to affect the heat recovery part of the process less than expected. In one embodiment the ventilation assembly has further been provided with a temperature sensor for the outbound ventilating air and a temperature sensor for the inbound ventilating air, functionally coupled to the control device, wherein in response to a temperature difference the control device sets the ventilation assembly in the first setting or in the second setting, in particular when the temperature of the inbound ventilating air has a temperature exceeding a set-temperature, and the outbound ventilating air has a temperature exceeding the set-temperature. Functional coupling means, as in other situations, that the parts are able to work together and are able to carry out a joint function. For that purpose, for instance parts may be connected to each other, engage onto each other, drive each other, exchange data wirelessly, and such. By means of functionally coupled temperature sensors, the control device is able take temperatures and on the basis thereof control or even adjust. In one embodiment the control device has been provided with a status indicator of the PCM material in the heat exchanger, wherein the status indicator indicates a charged or discharged condition of the PCM material. In that way the use but also the balancing and quantity of material can be optimised. In one embodiment the PCM material has been selected from PCM having a melting temperature that differs a maximum of 2 degrees from a set-temperature, in particular PCM having a melting temperature that differs a maximum of 1 degree from a set-temperature. – at least a second outlet for outbound ventilating air, that connects to another end of the second fluid connection and to another end of the third fluid connection. The heat exchanger may furthermore comprise a first adjustment device comprising a first or heat recovery setting in which circulation through the third fluid connection has been blocked, and a second setting in which circulation from the second inlet to the second fluid connection has been blocked. In the second setting outbound ventilating air is diverted via the diversion device. – wherein in the second setting outbound ventilating air is diverted via the diversion device. In one embodiment, in the second setting, the first inlet for inbound ventilating air has been connected to one end of the first fluid connection. In one embodiment, in the second setting, the adjustment device brings the first inlet in fluid connection with the end of the second fluid connection and the first outlet with the other end of the second fluid connection, so that inbound ventilating air is able to get into heat exchanging contact with the elements. – a second air displacement device for setting the outbound ventilating air into motion. The invention further relates to a method for ventilating a building or a room in a building by means of the ventilation assembly, wherein in a first setting inbound and outbound ventilating air are brought in heat exchanging contact with each other, wherein they are substantially separated by PCM material, and in a second setting inbound ventilating air is brought in heat exchanging contact with the PCM material and outbound ventilating air bypasses the PCM material, wherein it does not exchange heat with the PCM material and does not exchange heat with the inbound ventilating air. In one embodiment of the method, the PCM material has been provided in elements filled with PCM material, wherein the inbound ventilating air is brought substantially in contact with one side of the elements and the outbound ventilating air is brought in contact with the other side of the elements, wherein the thickness of the elements has been chosen such that the air-PCM heat exchanger will after a while act like a counterflow heat exchanger having a substantially constant heat transfer. In one embodiment of the method, in the first setting, when a measured outdoor air temperature is lower than a set heating threshold temperature, a flow rate of inbound and outbound ventilating air is lowered to a set minimum ventilating level. In one embodiment of the method, in the first setting, when a measured outdoor air temperature exceeds a set heating threshold temperature and a measured air supply temperature is lower than a set thermally comfortable air supply temperature and a measured indoor air temperature exceeds a set-temperature, air flow rates of inbound ventilating air and outbound ventilating air are increased. In one embodiment of the method, in the second setting, if the outdoor air temperature exceeds a set heating threshold temperature and an air temperature of the building or the ventilating air flowing into the room exceeds a thermally comfortable air supply temperature and an indoor air temperature exceeds the set-temperature and an indoor air temperature exceeds an outdoor air temperature, substantially all inbound ventilating air is brought into heat exchanging contact with the elements filled with PCM material, in particular the inbound ventilating air substantially flows around the elements filled with PCM. In one embodiment of the method, in the second setting, if the outdoor air temperature exceeds a set heating threshold temperature and an air temperature of the building or the ventilating air flowing into the room exceeds a thermally comfortable air supply temperature and the indoor air temperature exceeds the set-temperature and the indoor air temperature is lower than or equal to the outdoor air temperature, the outbound ventilating air is passed partially along and in heat exchanging contact with the elements filled with PCM material and is passed partially around the elements filled with PCM without exchanging heat with them. In one embodiment the method relates to a method for ventilating a broiler house provided with the ventilation assembly. With such buildings a good use of PCM material is possible, and a heat exchanger that can be cleaned well can be made. In one embodiment the method relates to a method for ventilating a commercial and industrial building provided with the ventilation assembly. The invention further relates to a control device for a ventilation assembly provided with a computer processor and computer program for, when running on the computer processor, carrying out the above-mentioned method. In one embodiment the ventilation assembly or the method relates to the use of air-PCM heat exchangers in the built-up environment in general, for instance in the agricultural sector, industrial building, commercial building and residential building. The assembly and the method are for instance highly suitable for the ventilation, cooling and heating of broiler houses. An example of a broiler house in for instance the Dutch climate and the tropical climate of Bangkok, Thailand, is discussed. The latter in particular in relation to summertime cooling. In an air-PCM heat exchanger phase changing material, further referred to as PCM, for instance serves as energy storage wherein it may serve as cooling agent, but it can also discharge stored heat and then serves as heating agent. In one embodiment the PCM contains a mixture of salt and water. PCM may contain an organic or inorganic material. In one embodiment the PCM material contains calcium chloride hexahydrate. This has also been described in the above-mentioned references. During solidifying the PCM is cooled and the environment heated. During melting the PCM is heated and the environment cooled. In one embodiment the ventilation assembly comprises PCM having a transition temperature of approximately 20-30°C. In one embodiment the PCM has a transition temperature of 22-27°C. For the Dutch climate a ventilation assembly in one embodiment comprises PCM having a transition temperature of approximately 23°C-25°C. In warmer regions a melting temperature exceeding these values will be selected. In other climatic zones, the melting temperature to be set is a function of the climatic zone in question. In the explanation below all this will be further elucidated. In one embodiment a device or heat exchanger as described in PCT/NL2012/050544 can be used. In one embodiment either the PCM or the panels as described in WO2013191554 can be used. The invention further relates to a ventilation assembly as described in this description or according to the claims. The term “substantially” as used herein will be clear to the expert. The term “substantially” may also comprise an embodiment with “fully”, “all” and the like. In one embodiment the adjective “substantially” may also be left out. Where applicable the term “substantially” may relate to 90% or more, such as 95% or more, in particular 99% or more, more in particular 99.5% or more, comprising 100%. The term “comprising” also includes embodiments in which the term “comprising” means “consisting of”. Furthermore, the terms first, second, third and the like are used in the description and the claims to distinguish between similar elements and not necessarily to describe a sequence or chronological order. It will be clear that the terms used that way are interchangeable under suitable conditions and that the embodiments of the invention described herein can operate in different orders than described or illustrated herein. The devices or apparatus that have been described, have among others been described in operation. It will be clear to the expert that the invention is not limited to methods or devices in operation. It is noted that in the claims, reference numbers when present, should not be considered a limitation of the claims. Use of the word “comprising” and its conjugations do not exclude the presence of further elements or steps other than those stated in the claims. The article “a” does not exclude the presence of several such elements. The invention can be implemented by means of hardware comprising several distinguishing characteristics, and by means of a suitably programmed computer. In the device claims enumerating such means, several such means can be provided by one and the same piece of hardware. The mere fact that several measures have been summed up in various dependent claims does not mean that a combination of these characteristics cannot be used advantageously. The invention furthermore relates to a device, method or process provided with one or more of the characterising measures described in the attached description and/or shown in the attached drawings. 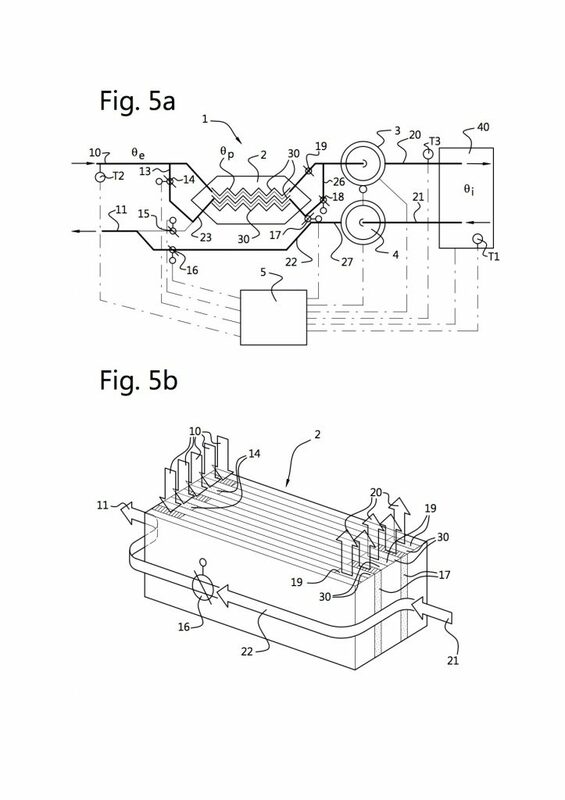 It will be clear that the various aspects mentioned in this patent application can be combined and that each individually may qualify for a divisional patent application. Figure 5B shows an embodiment of the heat exchanger provided with valves for realising desired flows for the operation as indicated in figure 5A. The figures are schematic and not necessarily to scale. Figure 1 schematically shows a ventilation assembly 1 for a building 40, for instance a broiler house or an office building. The ventilation assembly 1 has been provided with air displacement devices, here by way of example a speed-controlled ventilator 3 for the outbound air and a speed-controlled ventilator 4 for the inbound air. The ventilation assembly 1 has furthermore been provided with a control device 5. By means of one or more temperature sensors, the control device 5 measures the temperature in building 40, and optionally comprises a further sensor for the content of carbon dioxide, or ammonia, in the indoor air, as an indication of indoor air pollution. Sensors may also be used for other air pollutions of the indoor air. The control device 5 has in this case been functionally coupled to the air displacement devices 3, 4 for enabling the setting of an air flow rate of inbound and outbound air. The control device 5 has furthermore been operationally connected to valves 14, 15, 16, 17, 18 and 19. In addition the control device can be connected to temperature sensors T1, T2 and/or T3 as shown. Either by means of wiring or wirelessly, the control device 5 can be connected to the various parts. A connection to valve 18 has not been shown here, but may of course be present indeed. Valves may, if so desired, also be combined. The ventilation assembly has been provided with a heat exchanger 2 provided with PCM material 30. It regards an easy-to-clean air-PCM heat exchanger consisting of polypropylene (PP) of polyethylene (for instance HDPE) panels 30 filled with PCM material. Said heat exchangers have a low air resistance, for instance 20-30 Pascal. In one embodiment the heat exchanger 2 has been provided with panels with PCM material 30 which in a first setting (‘traditional’ heat exchanger) separate air flows from each other in a heat exchanging (or heat recovering) manner. In a second setting, air of one of either flows, flows along the panels with PCM 30 so that the temperature of the air flow is able to change temperature due to exchange of energy with the panels with PCM. The single air flow is heated or cooled. Heat exchanger 2 has a building-side outlet 20, a building-side inlet 21, an inlet 10 for (fresh) air from the outside of the building 40 and an outlet 11 for discharging air out of the building. 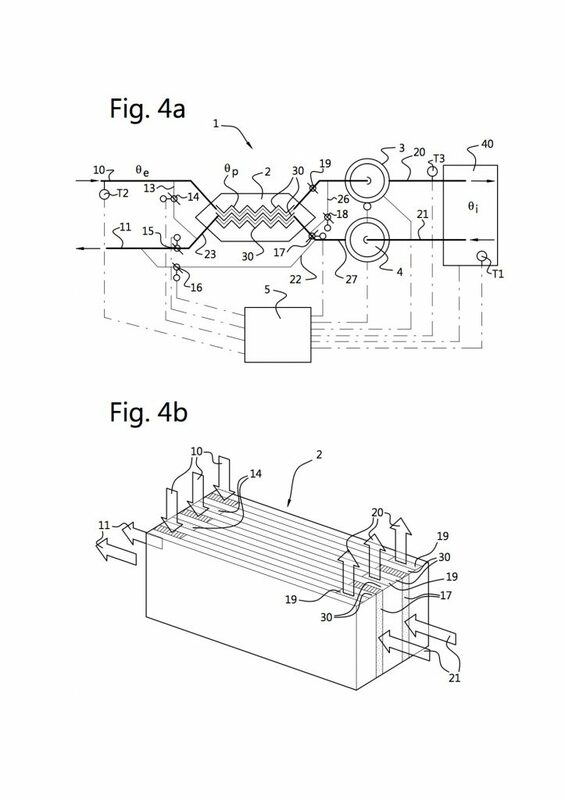 In the embodiment of figure 1 the ventilation assembly 1 further has a bypass channel 22 connecting building-side outlet 21 to the outlet 11 bypassing the heat exchanger 2. In that way in one setting, air leaving the building can bypass the heat exchanger 2. Building-side outlet 21 thus can be short-circuited with outlet 23. By means of control valves 14, 15, 16, 17, that are functionally connected to control device 5, it can be set whether air flows via and through the heat exchanger 2, or bypasses it via bypass channel 22. Via said building-side inbound ventilating channel 21, air can be introduced into a building or a room in a building. Via building-side outbound ventilating air outlet 20, air, also referred to as ‘room air’, can be discharged out of a building or a room in a building. Via bypass channel 22 said air can also be discharged immediately out(side) of the building. By means of valves 14, 15, 16 and 17 this can be set. Outdoor air inlet 10 has been connected to an inlet of the heat exchanger 2 for letting in (fresh) outdoor air into a building. An outlet 11 has been connected to (heat exchanger) outlet 23. By means of the heat exchanger 2 provided with PCM material, either building-side outbound air (room air) is able to exchange heat with inbound air. The heat exchanger 2 then functions as a ‘traditional’ heat recovery device. However, this does not include the time delay occurring in the process and additional heating made possible as compared to the traditional heat recovery apparatus. This mostly occurs in discontinuous situations. For instance, in office buildings ventilation and temperature control is required during office hours. Outside office hours this is required to a limited extent only, if at all. Often by the end of the workday the temperature will be relatively high and the PCM material has absorbed relatively much heat. When starting up immediately before or at the beginning of the workday, said stored heat can be used to pre-heat the relatively cool outdoor air. This can also take place in the first setting. The inbound outdoor air will then be relatively cool, the indoor air will usually be warmer, and the PCM material will be even warmer, relatively speaking, and able to give off heat. When valve 16 has been opened, valves 15 and 17 and 19 have been closed and valve 14 has been opened, bypass channel 22 becomes operational, and room air will bypass the heat exchanger 2. Inbound outdoor air will be directed along the PCM in the heat exchanger 2 and depending on the condition/temperature of the PCM material in the heat exchanger 2 either be cooled during the day and heated during the night. On the basis of figures 3A, 3B, 5A and 5B first the second setting of the ventilation assembly will be discussed at full load cooling or heating in general situations. The depictions are schematic, in figure 3A a flow channel for inbound (outdoor) air is shown. The air flows along PCM elements 30. Via the PCM elements 30 and the PCM included therein, heat exchange will take place in the (single) flow. On the basis of figures 2A, 2B, 4A and 4B the first setting of the same ventilation assembly will be discussed in which the inbound and outbound air flows exchange energy with each other via the PCM elements 30. In figure 2A an inbound (outdoor) air flow and an outbound (indoor) air flow are in counterflow with each other. For each only one channel is shown. A flow flows along one side of a PCM element and the other flow flows along the opposite side of said PCM element 30. The flows exchange energy via a PCM element 30 (and therefore via the PCM therein). Figure 3B shows a curve showing the relation between the temperature and the specific capacity of the PCM. In the following numerical calculations for an office building the successive parameters will be discussed again. One embodiment of the ventilation assembly regards the use in a broiler house. Below, such a use and design considerations will be discussed first. Then a use in for instance a commercial and industrial building will be discussed, and design considerations will be given. In for instance a broiler house chicks weighing 40 g can be fattened into broilers weighing 2.4 k in a time span of 42 days. In a broiler house an annual maximum of approximately 8 fattening cycles may take place. The comfortability temperature of chicks is approximately 33°C and for adult broilers approximately 20°C. When there is sufficient air movement in the chicken’s living zone, the comfortability temperature due to the wind chill factor can be increased from 20°C to 25°C and maybe even more. Regarding young chicks this means minimum air movement and maximum heat recovery, and regarding adult broilers maximum air movement and maximum cooling. A traditional ventilation assembly then functions as follows. In the first week the ventilation assembly runs at a minimum ventilation flow rate in order to discharge the waste products of the chicks (CO2, Ammonia). The heating device will perhaps be operational at full load to keep the broiler house at a temperature of 33°C. In the last week on the other hand, when the adult broilers are mature, the heating device will no longer be operational. The broiler house will then be ventilated at more than the minimum level, meaning at a larger flow rate than required for discharging waste materials. Using, or because of, the wind chill factor, the ventilation assembly starts functioning like a cooling installation at an excess (excess flow rate) of ventilating air. An air supply flow rate of 13 to 15 m³/h per chicken, a standard value in traditional installations for broiler houses, will then be insufficient to realise the ideal indoor temperature and additional cooling will need to be provided for. As stated above, a broiler fattening cycle in one embodiment takes 42 days (6 weeks). In said 42 days, chicks are fattened into broilers. During said cycle the ideal indoor temperature of the broiler houses changes according to the table below. The table above indicates said ideal temperatures (Cobb broiler management guide (2012)). Due to the air flow in a broiler house, the broilers experience a cooler temperature than the actual air temperature, this is also referred to as the ‘wind chill’ effect. The young chicks are hardly bothered by the wind chill factor during heating operation, as the ventilation flow rate will then be adjusted back to a minimum. For the Netherlands two extreme dimensioning situations can be distinguished. The first situation is the heating of the broiler houses containing 1-week old chicks in wintry conditions at a minimum ventilation flow rate. The second situation is cooling the broiler houses with 6-week old mature broilers in summery conditions with an excess of air in connection with the wind chill factor. It turned out that by using a ventilation assembly with PCM-heat recovery the air supply air flow can be lower than in traditional installations. It turned out that the air supply flow rate in one embodiment had been halved or was even three times as low for realising the same daytime indoor temperature as in a traditional installation. A further example of the ventilation assembly is discussed below for a building such as an office building, but also the above-mentioned broiler house. In this embodiment the ventilation assembly is also referred to as ‘PCM high efficiency-heat recovery ventilator convector’. In figures 4a and 5s such an assembly is shown in two different operating conditions. 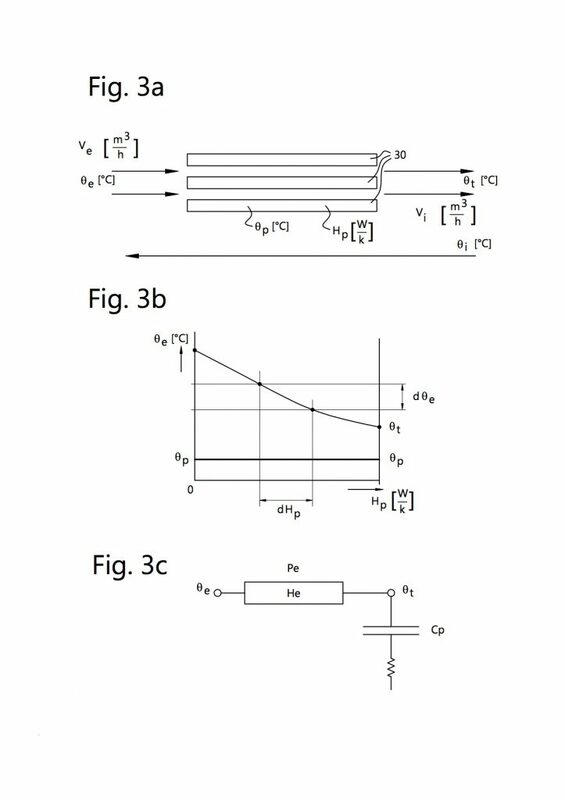 In figures 4b and 5b, settings of a possible embodiment of the heat exchanger 2 for the set-up of figures 4a and 5a, respectively, are shown. In this case the valves 14, 16 and 17 are for instance slides blocking the passages/channels. Dotted lines represent opened, hatched lines represent closed. The PCM elements 30 have also been shown, and for instance each one or more PCM elements as described in WO2013191554. Summarising the embodiment regards a PCM high efficiency-heat recovery ventilator convector with wintry heat recovery and summery cooling. The PCM high efficiency-heat recovery ventilator convector is in this case for instance dimensioned for summery full load cooling operation. Subsequently the seasonal operation is described taking full load wintry heating as starting point. Below follows a model calculation for instance for offices. Dimensioning at full load perceptible cooling capacity. In this case starting point is one OC AUTARKIS 198 mm HDPE panel (for instance described in WO2013191554, herein included by reference or as if fully copied) filled with ‘PCM 23’, meaning a melting temperature of approximately 23°C, and an adjacent air slit of 3-5 mm, specifically approximately 4 mm. The calculation relates to an office floor area of 10 m2 having a perceptible cooling load of 50 W/m2 (95% of the offices). 2.1. Full load wintry heating operation indoor temperature 20°C and an outdoor temperature of -10°C. Partial load cooling operation spring and autumn, this is the area of the direct free outdoor air cooling. Indoor temperature 23°C and the outdoor air temperature 10°C. Full load cooling operation summer, this is in the area of the indirect free outdoor air cooling. Indoor temperature 27°C and the maximum outdoor air temperature 30°C. See dimensioning at the start. It regards the operation by means of indirect free outdoor air cooling contrary to the operation according to the above paragraph regarding direct free outdoor air cooling. The PCM now has to be discharged at night. – With broilers for instance, the situation of minimum ventilation and maximum heating will perhaps occur 8 times a year, each time when new chicks are placed in the fattening broiler house for a 42-day fattening cycle. This operational condition will furthermore have to prevail day and night in case of chicken. – In office buildings it will regard the decentralised PCM ventilator convectors per room or per 20 m2 meter floor area. In case of broiler houses it will likely regard larger centralised PCM ventilator convectors, more in the form of air handling units. In one embodiment the air-PCM heat exchanger 2 is dimensioned for the summery cooling situation. In the example for instance 600 m3/h for 20 m2 of office floor area in the Netherlands. This setting is shown in figures 5A and 5B. Outdoor air inlet 10 has now been coupled to inlet channel so that all inbound outdoor air now contacts the PCM and can be cooled. Building-side inbound ventilating air channel 21 has now been coupled to outlet channel 11. Building-side outbound ventilating air channel 27 has now been coupled to bypass channel 20 so that the outbound air bypasses the heat exchanger and does not contact the PCM. The valves 14, 15, 16, 17 that are among others shown in the figure 1, 4A and 5A can be designed as combined slides as schematically shown in figures 4B and 5B. In the situation of figure 4A outdoor air 21 enters and the slides 17 are open. The air flows along a side of PCM elements 30 and leaves the heat exchanger 2 at arrows 11. Air from the building, indicated by arrows 10, passes through the open slides, shown in hatched lines. Slides 14 (in dotted lines) are closed. The air, indicated with arrows 20, leaves the heat exchanger 2, via open slides, indicated in dotted lines. The other slides, indicated in hatched lines, are closed on this side. The air from the building flows along another side of the PCM elements 30 than the inbound air does. Both flows are largely in counterflow with each other, and exchange energy via the PCM elements 30. 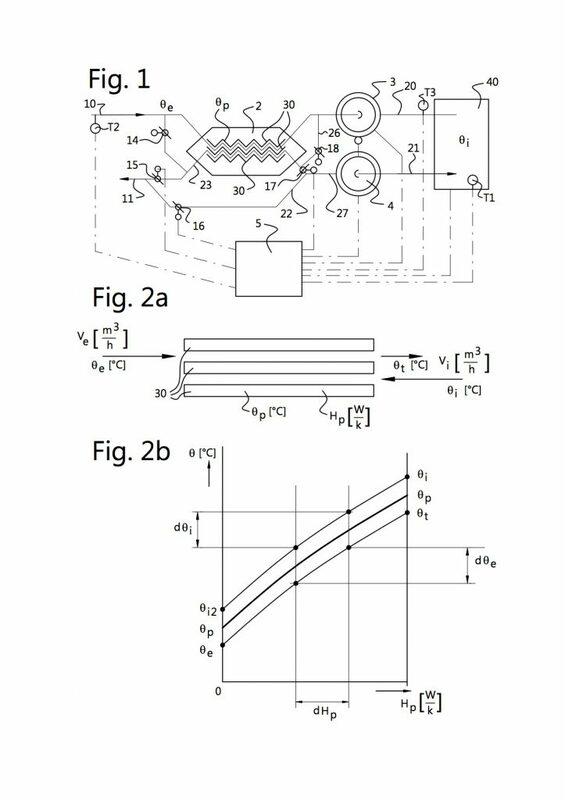 In figure 5B the air from the building bypasses the heat exchanger 2 via fluid connection 22. The slides 17 are now closed. All other slides are now open, that means both the slides 14 and the slides at the opposing upper end. Five arrows 10 are now inbound and five arrows 20 are outbound. The cross-sectional area of the inbound air through the heat exchanger now is larger than in the first setting according to figure 4B. In one embodiment the cross-sectional area for the fluid connection for the inbound air from outside of the building in the second setting of figure 5B is at least twice as large as in the first setting according to figure 4B. It will be clear that the openings in the heat exchanger 2 may also be positioned such that one of either flows 10, 20, the inbound flow 10 or outbound flow 20, that exit the heat exchanger at the upper side in the depiction, can also flow out at the bottom side of the heat exchanger 2. First setting: ventilating and full load heating by heat recovery by means of a PCM heat exchanger. This corresponds to what has been described above in 2.1. Flow rate supplied air equals flow rate discharged air. If for instance a measured outdoor air temperature T2 is lower than a (set) heating threshold the supply and discharge ventilators 3, 4 are adjusted back (the flow rate is lowered for instance by lowering the number of revolutions) to a minimum ventilation level. Said minimum corresponds to a set minimum ventilation flow rate. The valves 14, 16 and 18 close and valves 15, 17 and 19 open. If the measured temperature T1 in the building or a room is lower than the set heating temperature or a set or ‘setpoint’ temperature an additional heating becomes operational if so desired. Ventilating and partial load cooling by means of heat recovery by means of the PCM heat exchanger. This corresponds to what has been described above in 2.2. If the measured outdoor temperature T2 exceeds the (set) heating threshold and the measured air supply temperature T3 is lower than a (set) thermally comfortable air supply temperature and the measured indoor air temperature T1 exceeds the set or ‘setpoint’ temperature, respective air flow rates the supply and discharge ventilators 3, 4 are increased. Ventilating and partial load cooling by means of the PCM heat exchanger. This corresponds to what has been described above in 2.3. If T2 exceeds the heating threshold and T3 exceeds the thermally comfortable air supply temperature and T1 exceeds the ‘setpoint’ temperature and T1 exceeds T2, then the valves 14, 16 and 18 are opened and valves 15, 17 and 19 are closed. Ventilating and full load cooling by means of the PCM heat exchanger. This also corresponds to what has been described above in 2.3. If T2 exceeds the heating threshold and T3 exceeds the thermally comfortable air supply temperature and T1 exceeds the ‘setpoint’ temperature and T1 is smaller than or equal to T2, then the valve 14 is opened and valve 15 is partially closed to a stop limit. In office buildings it will then be possible that no or minimum additional cooling, for instance compression cooling, suffices, as the outdoor air flow rate can be increased independent of the ventilation flow rate. Additional heating may however be required in buildings that are poorly insulated. It will be clear that the above description is included to illustrate the operation of preferred embodiments of the invention and not to limit the scope of the invention. Starting from the above explanation many variations that fall within the spirit and scope of the present invention will be evident to an expert. – a second setting in which inbound ventilating air has a second air supply flow rate and in the heat exchanger (2) is substantially in heat exchanging contact with the PCM material (30), wherein inbound and outbound ventilating air are not in heat exchanging contact in the heat exchanger (2), and wherein the second air supply flow rate exceeds the minimum requirement of ventilation flow rate for creating extra cooling. Ventilation assembly according to claim 1, wherein the second air supply flow rate is at least twice as large as the first air supply flow rate. Ventilation assembly (1) according to claim 1 or 2, wherein in the first and/or second setting the air displacement device has been set for a balanced ventilation. Ventilation assembly (1) according to any one of the preceding claims, wherein the air displacement device comprises an inbound air displacement device for displacing inbound ventilating air and an outbound air displacement device for displacing outbound ventilating air. Ventilation assembly (1) according to any one of the preceding claims, wherein the inbound and outbound ventilating air are separated in the heat exchanger (2) by means of PCM material (30), in particular PCM elements, wherein in particular the PCM elements comprise a container of synthetic material, which container is provided with PCM material. Ventilation assembly (1) according to any one of the preceding claims, further provided with a temperature sensor for the outbound ventilating air and a temperature sensor for the inbound ventilating air, functionally coupled to the control device (5), wherein in response to a temperature difference the control device (5) sets the ventilation assembly (1) in the first setting or in the second setting, in particular when the temperature of the inbound ventilating air has a temperature exceeding a set-temperature, and the outbound ventilating air has a temperature exceeding the set-temperature. Heat exchanger (2) according to any one of the preceding claims, wherein in the second setting the first inlet for inbound ventilating air is connected to one end of the first fluid connection, wherein in particular the second setting of the adjustment device puts the first inlet in fluid connection with the end of the second fluid connection and the first inlet with the other end of the second fluid connection, so that inbound ventilating air may come into heat exchanging contact with the elements. Method for ventilating a building or a room in a building by means of the ventilation assembly (1) according to any one of the preceding claims, wherein in a first setting inbound and outbound ventilating air are brought in heat exchanging contact with each other, wherein they are substantially separated by PCM material, and in a second setting inbound ventilating air is brought in heat exchanging contact with the PCM material and outbound ventilating air bypasses the PCM material wherein it does not exchange heat with the PCM material and does not exchange heat with the inbound ventilating air. Method according to the preceding claim, wherein the PCM material has been provided in elements filled with PCM material wherein the inbound ventilating air is brought substantially in contact with one side of the elements and the outbound ventilating air is brought in contact with the other side of the elements, wherein the thickness of the elements has been chosen such that the air-PCM heat exchanger (2) will after a while act like a counterflow heat exchanger having a substantially constant heat transfer. Method according to any one of the preceding claims 11-12, wherein in the first setting, when a measured outdoor air temperature is lower than a set heating threshold temperature, a flow rate of inbound and outbound ventilating air is lowered to a set minimum ventilating level, in particular, wherein in the first setting when a measured outdoor air temperature exceeds a set heating threshold temperature and a measured air supply temperature is lower than a set thermally comfortable air supply temperature and a measured indoor air temperature exceeds a set temperature, air flow rates of inbound ventilating air and outbound ventilating air are increased. Method according to any one of the preceding claims 11-12, wherein in the second setting if the outdoor air temperature exceeds a set heating threshold temperature and an air temperature of the building or the ventilating air flowing into the room exceeds a thermally comfortable air supply temperature and an indoor air temperature exceeds the set temperature and an indoor air temperature exceeds an outdoor air temperature, substantially all inbound ventilating air is brought into heat exchanging contact with the elements filled with PCM material, in particular the inbound ventilating air substantially flows around the elements filled with PCM, wherein in particular the second setting if the outdoor air temperature exceeds a set heating threshold temperature and an air temperature of the building or the ventilating air flowing into the room exceeds a thermally comfortable air supply temperature and the indoor air temperature exceeds the set temperature and the indoor air temperature is lower than or equal to the outdoor air temperature, the outbound ventilating air is passed partially along and in heat exchanging contact with the elements filled with PCM material and is passed partially around the elements filled with PCM without exchanging heat with them. Control device (5) for a ventilation assembly (1), provided with a computer processor and computer program for, when running on the computer processor, carrying out the method according to any one of the preceding claims 11-14.